Species of the genus Entomophthora cause epizootics in various insects around the world, but such infections are less common in California. Burger and Swain (1918) reported Entomophthora chromaphidis infections in the walnut aphid, Chromaphis juglandicola, in Southern California. With infections as high as 95%, the fungus was a significant mortality factor in aphid populations. In 2011, nearly a century after the epizootics in the walnut aphid, a single strawberry aphid, Chaetosiphon fragaefolii, was found infected with a species of Entomophthora in an organic strawberry field (Eraud Farms) in Santa Maria. The strawberry aphid is an occasional and minor pest in strawberry in California. Attempts to in vitro culture the fungus were unsuccessful, but microscopic measurements of conidial size and shape indicate that the causal agent could be Entomophthora planchoniana. Bell-shaped conidia measured 17.3 μm or micrometers (14.8-20.1) long and 14.6 μm (12.7-17.7) wide (based on the measurements of 100 conidia) and had a broad base (papilla) and a pointed apex. Conidia also appeared to have 4-6 nuclei. E. planchoniana and E. chromaphidis are closely related and were previously considered as synonymous species (MacLeod et al., 1976; Waterhouse and Brady, 1982). Humber and Feng (1991) later described these two as separate species due to the variation in conidial size, geographic distribution, host range, in vitro culturing techniques, and other characteristics. While E. planchoniana is commonly found in Europe, E. chromaphidis is reported elsewhere. The following are the characters of E. chormaphidis and E. planchoniana from Keller's (2002) description of 22 species of Entomophthora. First found in walnut aphids in California. Primary conidia are 11-14 μm long and 10-11 μm wide with 4-6 nuclei and contain a single large oil globule. Resting spores are 30 μm. Insect host is attached to the plant surface with fungal rhizoids (bundles of modified hyphal bodies). First found on unidentified aphids on elder in western Europe. Primary conidia are 15-20 μm long and 12-16 μm wide with 4-11 nuclei [species description has 4-11 and key has 5-9 nuclei in Keller (2002)]. Resting spores are 31-38 μm. The fungus produces rhizoids to attach the host insect to the plant surface. Keller (2002) noted an overlap in the number of nuclei between these two species and suggested the size of primary conidia as the distinguishing character. Hence the fungus found in the strawberry study is considered E. planchoniana, which was first reported in 1948 in the strawberry aphid, then known as Pentatrichopus fragariae (Petch, 1948; Leatherdale, 1970). Cédola and Greco (2010) reported E. planchoniana as a major mortality factor of the strawberry aphid in Argentina. The infection process starts when a conidium (single spore) comes in contact with the insect cuticle, produces a germ tube and gains entry into the insect body with the help of a penetration peg and cuticle degrading enzymes. The fungus multiplies inside the insect body as protoplasts (cells without a cell wall) and invade the tissues. Vegetative growth stops when nutrients are depleted and the insect is dead. The fungus then produces conidiophores that emerge from the cuticle, produce bell-shaped primary conidia that are forcibly discharged. A halo of protoplasm (cellular contents) is often seen around the primary conidium, which may either produce the germ tube to cause infection or a secondary conidium. Secondary conidia are smaller than primary conidia, have rounded or less pointed apices, and more rounded basal papillae. This is the first report of the occurrence of E. planchoniana in the strawberry aphid in California. Although strawberry aphid is not an important pest in California and only one infected aphid was found, this finding is important to record the distribution of E. planchoniana. Burger, O. F. and A. F. Swain. 1918. 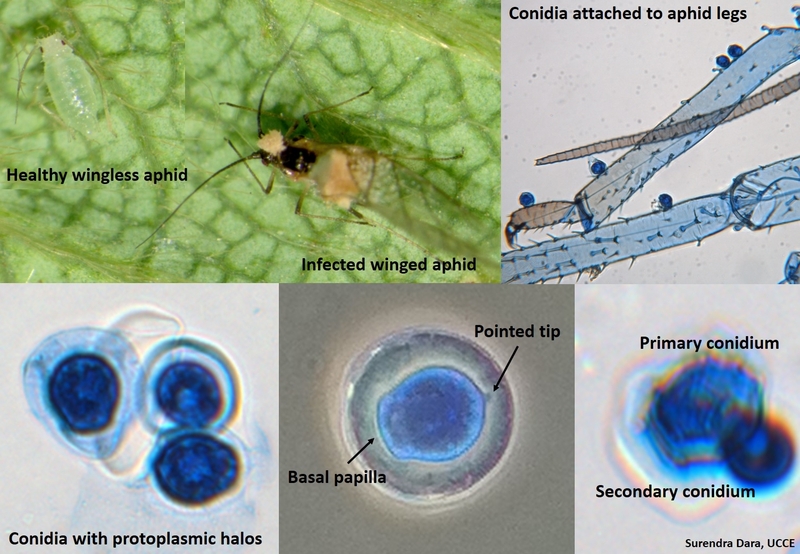 Observations on a fungus enemy of the walnut aphis in Southern California. J. Econ. Entomol. 11: 278-289. Cédola C. and N. Greco. 2010. Presence of the aphid, Chaetosiphon fragefolii, on strawberry in Argentina. J. Ins. Sci. 10: 1-9. Humber, R. A. and M.-G. Feng. 1991. Entomophthora chromaphidis (Entomophthorales): the correct identification of an aphid pathogen in the pacific northwest and elsewhere. Mycotaxon 41: 497-504. Leatherdale, D. 1970. The arthropod hosts of entomogenous fungi in Britain. Entomophaga 15: 419-435. MacLeod, D. M., E. Müller-Kögler, and N. Wilding. 1976. Entomophthora species with E. muscae-like conidia. Mycologia 68: 1-29. Petch, T. 1948. A revised list of British entomogenous fungi. Trans. Brit. Mycol. Soc. 31: 286-304. Waterhouse, G. M. and B. L. Brady. 1982. Key to the species of Entomophthora sensu lato. Bull. Brit. Mycol. Soc. 16: 113-143.